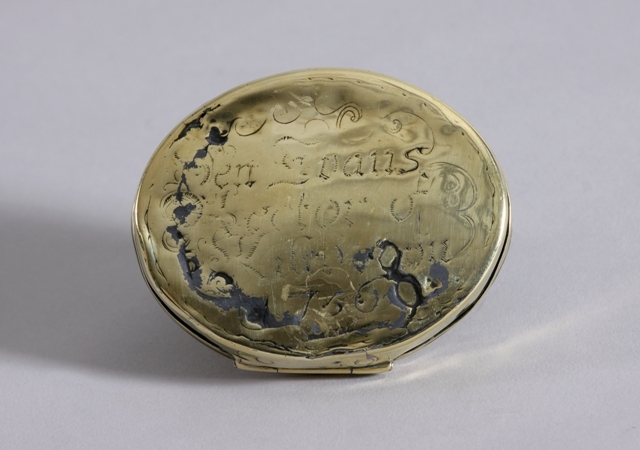 The lid engraved with an image of an eagle or phoenix. Benjamin Evans was Rector of Kilrhedyn from 1727until his death in 1782. His father was Rev Evan Evans, Vicar of Clydey, Pembs 1688 – 1731 (and his father was John Evans of Llangoedmore, near Cardigan). He went up to Brasenose College Oxford in March 1720 aged only 14, but transferred to Magdelen, where he got his BA in March 1724. Kilrhedyn or Cilrhedyn, is a parish that straddles both Pembrokeshire and Carmarthenshire, on the river Cych near Newcastle Emlyn.